In case you are looking for an exhilarating pokie adventure, then Pandora’s Box can be considered to be the perfect game for you. There are 20 pay lines and 5 reels waiting for you and this game can really take you to an incredible and unforgettable adventure back to Greek Mythology. This game brings back the story behind the Pandora’s Box. There are tons of great prizes that you can unveil once you start playing the game. The game looks wonderfully enticing and you have the opportunity to trigger a couple of bonus features that are rewarding offering you a great potential once activated. The graphics of Pandora’s Box are able to get you right in the middle of the action. The game is really unique and manages to stand out of the crowd, thanks to the way everything is laid out. 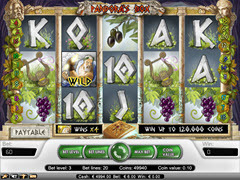 The influence of the Ancient Greece can be seen right from the minute you open this pokie. The added effort in the design of the game really does add to the experience ne gains while playing it. There are green vines transcending down the left and right sides of the game. The color of the background really allows the symbols and colors to all come through well and the added sound effects are appropriate and have the power to enhance the overall experience that you have while playing this game. You will have a blast while playing the Pandora’s Box and the real fun starts once you hit the special symbols and trigger the special features. For example, there are two different wilds available: a blue one and a golden one. The Gold one is really special as it only appears on the third reel and once that happens the winning combinations will only increase. The Blue wild will multiply wins by two, possibly awarding a win of 10,000 credits! Get the scatters on the reels and you will be able to activate the free spins, which can be really profitable. There are from 10 and up to 30 free spins available, based on the number of scatters that you have on the reels and all wins that are completed are multiplied by three. 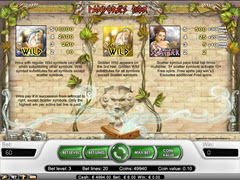 This Net Entertainment pokie will stand out of the crowd thanks to the nice Greek Mythology theme and also the fabulous graphics that are waiting for you. There are a few nice special features that can bring great bonuses.